Liverpool’s prospects of winning their first league title in 29 years have seemingly been hit in recent weeks by injuries in defensive positions. Fortunately for them, they have a couple of versatile players like Fabinho and James Milner who can capably cover for Joe Gomez and Trent Alexander-Arnold. Their versatility helps negate the need for transfers or loans during the January window. 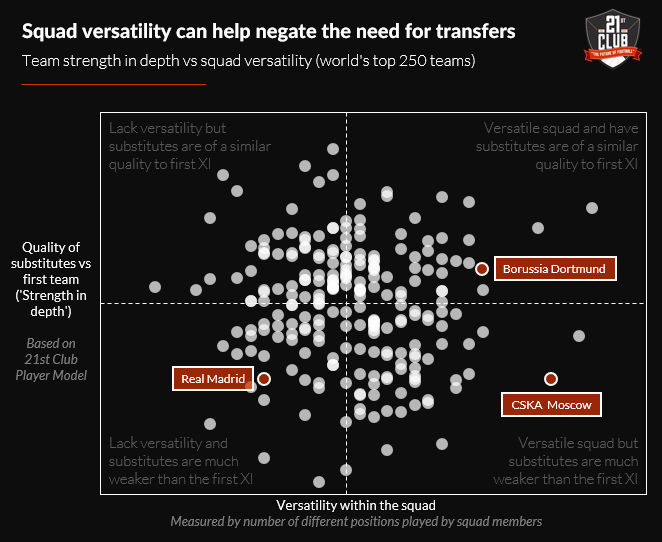 An ability to play multiple positions is often a consideration for clubs in recruitment, but it’s not usually a make-or-break attribute. Whether it should be is something Real Madrid might be considering now; hit with injuries as they try to ensure a top four finish and progression in the Champions League, they don’t have many players who are used to playing in different positions (below). Indeed they have one of the least versatile squads among Europe’s top teams, and the gap in quality between their best players and their substitutes might mean they need to recruit this window. On the flip side, Borussia Dortmund would be well-equipped to handle an injury crisis after the winter break. Besides having a relatively small gap in quality between their starters and substitutes, they have players who can play across the front four as well as individuals like Lukasz Piszczek and Raphaël Guerreiro who have deputised in central defensive or midfield positions outside their usual wide roles. With it being challenging to sign players in January, players who can step in are almost like a new signing in themselves. In recruitment, smart clubs don’t just treat versatility as a bonus, but as a trait worth paying for – it might even be a money-saver in windows down the line.